Living in Ybor City has it's benefits. One of the best things about being located two blocks from 7th Ave. is the ability to multiple restaurants and not have to worry about driving home. I am frequently asked what my favorite restaurant in Ybor is and honestly, the answer changes on my mood. We have so many great restaurants that I cannot choose just one. Three summers ago, when Gabe decided to attend USF for his Masters, I joined him to check out the city. Prior to that trip, the only times I had been to Tampa was going to Busch Gardens or a Bucs game. On our way back to Daytona, we stopped in Ybor City to grab dinner. Craving sushi, we ended up at Samurai Blue Sushi & Sake Bar. I would have never imagined that a year later, we would be Ybor City residents, still frequenting Samurai Blue, a gorgeous restaurant with high brick ceilings, located in the historic Centro Ybor. We always order 2-3 rolls, accompanied by Crab Rangoons. I have never had a bad meal at Samurai Blue and we love bringing out of town guests here. The sushi is always amazing and beautifully presented. I strongly encourage a date night here, followed by a movie or a visit to the Ybor Wine Bar. 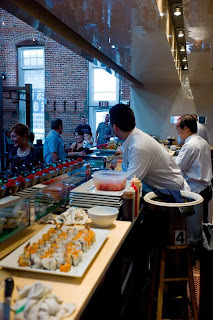 Here are some of our favorite items from my favorite sushi bar! Volcano Roll: There is tuna inside of this Volcano Roll! Topped with slices of avocado and Conch. While I find the conch a little chewy for my personal taste, overall this is a delicious roll and one of the items we frequently order. Hawaiian Roll: This is the perfect roll to a new sushi eater. While I prefer raw rolls, the Hawaiian Roll is one of the best tempura based rolls I have ever had. Tempura shrimp, mango, coconut, cream cheese and asparagus, topped with macadamia nuts. Yes Please! Lobster Roll: If you are in the mood for an amazing roll - order the Lobster Roll. Inside sits tuna and crab and on top is delicious tempura Lobster. This is one of our favorites if we are in the mood for some tempura. Tokoyo Roll: I am borrowing this photo from my friend Leslie (www.leslie-floyd.com) as mine was too dark and grainy. Tuna and Yellowtail in one roll. Hello Lover! Crab Rangoons: We never start a meal at Samurai Blue without an order of crispy and delicious crab rangoons. Hand down the best I have ever had in my life. Made with Lump Crab, Cream Cheese & Chives in a Crispy Wonton Wrapper, you cannot go wrong. Cakebread Chardonnay by the glass!! Yes, you heard me correct. It is very rare to find a restaurant who serves my favorite Chardonnay by the glass. Priced right too. I never go to Samurai Blue without getting a glass of my favorite "juice". That sushi looks awesome! I want the lobster one! You and Joe need to come down to Ybor one night and come here with us! I wish they put something else on the volcano roll because it would be the best roll on earth if so!!! We need to go here again soon. MMMM I love Samurai Blue! It was the first place I ate when visiting Tampa (before I moved here) and it is still my favorite sushi spot. That is so funny, me too!!! Agreed on the best sushi spot. I've still never eaten at a sushi bar for a meal...sushi newbie of course! Those crab rangoons look yummy! Oh, we need to make a lunch date.